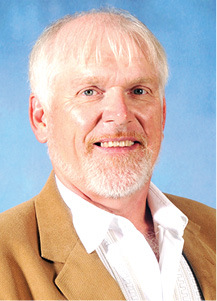 In the aftermath of what has been labeled a tragic farming accident, the Clinton County community went into mourning with the passing of former long-time Clinton County Schools Band Director, Doug Sell. Sell was pronounced dead at the scene by Clinton County Deputy Coroner Lonnie Scott Wednesday morning around 10 a.m. The accident occurred on Sell’s farm on 697 Bill Perdue Road, off KY Hwy. 639. Scott said Sell was operating a Bobcat at the time of his death and with the nature of the accident, an investigation more than likely won’t be warranted. Sell spent most of his time doing the two things he was best known for, farming and music. More than 100 people came out to Clinton County High School Wednesday night to gather out of respect for a man who loved his students and dedicated his entire life to teaching those students the art of music. The cafeteria was filled with students as young as middle school to former graduates and Alumni Band members. After 30 years as a teacher and band director, Sell retired at the end of the 2018 school year. Sell’s love for music even went beyond the teachings to his students, as he was an active member with the Alumni Band, which was established in 2014. The Alumni Band performs in several venues throughout the year, including the Foothills Festival, Relay for Life, sporting events and also performs for the public at spring concerts along with the high school and middle school bands. Monday night’s memorial was filled with people standing up and telling what Sell meant to them and things he’s done for so many students at Clinton County. Hubbs addressed the saddened crowd Monday night with what music is and how Sell might have felt about it. During the memorial, a video was played, which was made in 2016 by the 18 seniors who were in band that year. The video was a gift to Sell in appreciation for his hard work towards those seniors. Each senior expressed their gratitude and told how he and music had touched their lives. Funeral services were held for Sell on Saturday at 3:30 p.m. at the Clinton County High School. A complete death notice can be found on page 4 of this week’s NEWS. 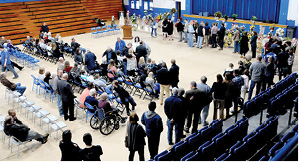 The line to the casket of former Band Director Doug Sell reached all the way across the Clinton County High School gymnasium floor and out into the lobby of the high school Friday afternoon as people stopped to pay their respects during visitation. Sell was buried on Saturday after a tragic farming accident took his life.